Summer and winter, morning, noon and night, Lt. Daniel O'Callaghan wore his thick black bunker pants around the Ladder Company 4 firehouse in Midtown Manhattan. "It would be 102 degrees out, and he'd be wearing his bunker gear," said Al Schwartz, a firefighter who drove the truck with the lieutenant sitting up front beside him. "He was always ready to charge in." 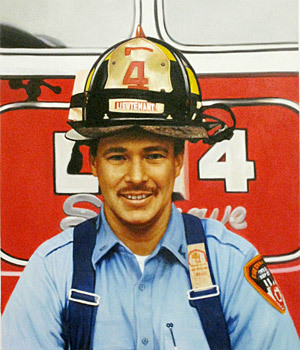 This was a man who set the Fire Department like a seal upon his heart as well as a seal upon his arm. But he also taped paintings by his 6-year-old daughter, Rhiannon Rose, to his office walls at the firehouse, and when he left his house would back his pickup truck up the street just to wave goodbye one more time to his 17-month-old, Connor Daniel. And when he left their home in Smithtown, N.Y., to work a 24-hour shift, he left a trail of Post-It notes in places where his family would find them: the dresser drawers, the refrigerator, the pillows. "He'd draw smiley faces on them," said his wife, Rhonda, who married him on his 31st birthday, "and he'd write 'I love you' or 'I miss you' on them." A lot of firemen work second jobs to make ends meet. But not Lieutenant O'Callaghan, who would have turned 43 today. "He was always with us," his wife said. "I'm glad, because my daughter has all these special memories." He usually carried a battered prayer card with a book of matches stapled to it in his jacket pocket. It was his good-luck charm. On Sept. 11, he left it behind. Profile published in THE NEW YORK TIMES on February 3, 2002.